MOSCOW — We have a saying in Russia, Stanislav Cherchesov had told reporters from behind his fearsome mustache on Saturday afternoon. The statement — a day before his Russian team would play Spain in the World Cup’s round of 16 — was both pushback and premonition. Cherchesov knew what everyone was thinking: that his Russia, the lowest-ranked team in the field, had done well at its home World Cup but had surely reached the end of the road against Spain, a former world and European champion. But Chershov trusted his boys, and they played like heroes on Sunday. 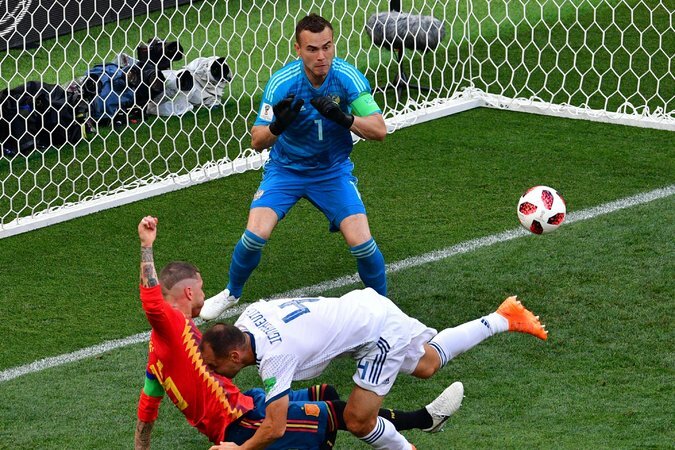 And now they will keep playing: Russia eliminated Spain on penalties, 4-3, after a 1-1 tie, when goalkeeper Igor Akinfeev used his trailing left foot to kick away Iago Aspas’s fifth attempt for Spain. 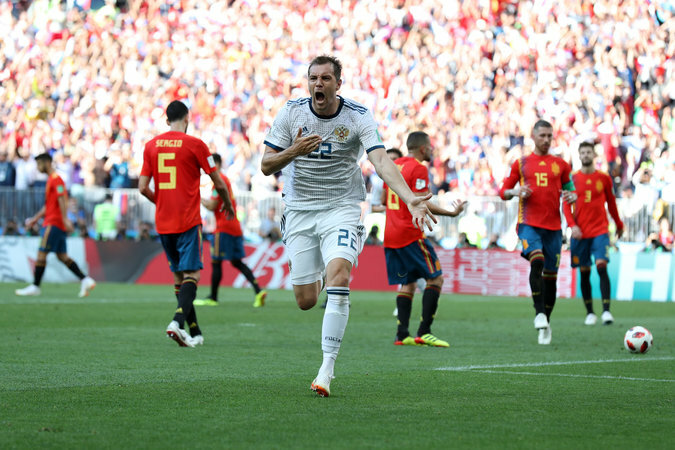 The Russians were dominated on the field for 120 minutes, but a penalty kick by Artem Dzyuba before halftime and a gritty, disciplined defensive effort achieved what many had considered unthinkable. Cherchesov and Russia have several heroes to choose from now. They can start on Saturday in Sochi, where they will play the Croatia-Denmark winner in the quarterfinals. They will start with Akinfeev, perhaps, who saved two of Spain’s five penalties. Or Dzyuba, who created and then converted the penalty that drew Russia level in a game in which appeared comically overmatched at times. Or maybe Sergey Ignashevich, the 38-year-old center back — drafted into the World Cup late in preparations — who has played every minute, and who gave his five-man back line the leadership and the structure to hold off Spain again and again. To say Spain played Russia to a draw was technically true. But in reality Spain played and Russia chased for most of the match inside the cavernous Luzhniki Stadium, the former content to keep possession of the ball after an early goal and the latter, well, content to let them have it. For 10, 15, 20 passes at a stretch, Spain worked the ball around the field at will — a game of keepaway disguised as a World Cup elimination match. The pro-Russian crowd whistled its disapproval early and repeatedly, and urged its team on with all its might whenever it managed — even briefly — to steal the ball away from the Spaniards. But Spain, inevitably and repeatedly, simply took it back. And kept it. The Dutch referee, Bjorn Kuipers, called a hand ball. Dzyuba buried it past David De Gea and just like that, Russia — and its crowd — came to life. They will get at least one more chance to cheer their heroes. The Russian team goes crazy as a jubilant Moscow crowd cheers on their advancement to the quarterfinals. Russia was considered one of the weakest teams in the tournament, and Spain one of the favorites. But in 120 minutes Spain could only force one own goal, and when it comes down to penalties anybody can beat anybody. Andrew Das: Stunning finish there as Akinfeev kicks away the last attempt by Aspas. The Russians pour toward him and he dives, fists outstretched into the grass to absorb their love. The crowd has gone absolutely bonkers in here. MISS Spain! Akinfeev dives the wrong way but gets a foot on Iago Aspas’s penalty! GOAL Russia! Denis Cheryshev goes down the middle as David de Gea dives to his side. GOAL Spain! Sergio Ramos with exaggerated slow steps and sends Akinfeev the wrong way. GOAL Russia! Aleksandr Golovin powers the ball under a diving de Gea. MISS Spain! Koke’s shot isn’t enough to the side, and Akinfeev dives to his right and stops it. GOAL Russia! Sergey Ignashevich’s stutter step sends de Gea the wrong direction. GOAL Spain! Gerard Pique powers his shot into the bottom left corner as Akinfeev once again dives the wrong way. GOAL Russia! David de Gea gets his right hand onto it, but Fedor Smolov’s shot is too powerful. GOAL Spain! Andres Iniesta easily puts it into the back of the net as Akinfeev dives the wrong way. Spain wins the coin toss, and captain Sergio Ramos elects for Spain to shoot first. EXTRA TIME IS OVER! The referee blows his whistle, and we are going to penalties! Rodrigo gets off a low shot from the top of the box, but Akinfeev easily falls to his side and saves it. Russia gets a corner kick but the ball is deflected out of danger. Just a few minutes left for Spain to get a winner here. If you are wondering how attacking Russia has been for the last hour and change, the answer is: Not very! Another Spanish error almost frees Russia. Pique tried to navigate out of trouble in his own box and loses the ball, but Spain clears. Andrew Das: Dramatically cooler in here suddenly as the weather changes — just what the tiring Russians needed. What they needed more was the corner they just won. A beautiful Spanish free kick drifts achingly beyond three Spanish players, and they IMMEDIATELY sprint to referee Bjorn Kuipers to argue that Pique and Ramos were held and deserve a penalty. Andrew Das: That really should have been a penalty for the hold on Ramos. He couldn’t get free of his man and the ball sailed within a few feet of him. Nope. Kuipers waves play on. Spain is generating a good chance every two minutes. If there were an hour left in this game they would surely score, but Russia might be able to hold out for just 10 minutes more. Andrew Das: Did they chant “Russ-see-ya!” this much in Rocky IV? Russia with a free kick just inside their own half ... and it is kicked out for a Spanish goal kick. You almost get the sense that Russia doesn’t care one bit about trying to score. Andrew Das: There is something you have to respect about the stubborn way Spain plays on days like this. It’s as if they’re refusing to change — flatly refusing — in the face of overwhelming evidence what they’re doing isn’t working. “We will win our way,” they seem to be saying. “However long it takes.” The trust, the belief, inherent in that is admirable. The question is: will it be successful? Rodrigo with a beautiful dummy along the sideline, and he sprints forward in the most pulsing move a Spanish player has made all day. But his tight angle shot is blocked by Akinfeev, and Dani Carvajal can’t get a strong shot on the rebound. Andrew Das: Was that Spain’s best chance to win it before penalties? Maybe. Rodrigo loses his man with a brilliant dummy in the open field, but Carvajal lashed the rebound into a defender. Soooooo close there. Fifteen more minutes before we go to penalties. A basically 50/50 chance at winning on penalties would be a great outcome for Russia, so perhaps Spain is going to push even higher for a winning goal? Spain earns a free kick in the final minute of the first period of extra time, and Pique gets a head to Koke’s ball, but it is straight at Akinfeev. Andrew Das: Pique’s header is saved and the crowd rises and cheers as one. They really believe now. Iago Aspas attempted to go one-on-four but his shot was blocked. At least he went for it though! Andrew Das: The 38-year-old Ignashevich fighting off the substitute Aspas — twice — to clear on that break just now is the most tangible sign of how much Russia is willing to give here today. Disciplined, noble effort under sustained pressure. They can be proud, however it ends. Marco Asensio gets a clear shot, but a soft kick from 20 yards out goes right into Igor Akinfeev’s hands. Andrew Das: Asensio follows up Koke’s long-range attempt with one of his own. Maybe one of those will shake something loose here, but it telegraphs that Spain realizes it might want to score soon rather than leave this to PKs in a hostile stadium. Momentum in those can do funny things. Koke with the most un-Spain moment of the day there, firing off a shot from 35 yards. Maybe he’s had enough, too. That was a frustration ball that landed 35 rows up. Isco immediately plays a piercing ball through to Aspas who cuts it back for Dani Carvajal, but his shot is blocked. We are back underway. It is a hot day in Moscow and a few players have cramped up already. This game may come down to one side making a tired mistake. As a reminder, for the first time in the World Cup, the teams will be given a fourth substitute to hopefully spice up the extra time period. Andrew Das: That could be big for Russia, which used its first three early (by the 65th minute). Passes completed: Spain 772, Russia 169. The key category, as always, is goals. And that one’s 1-1. Spain gets one last cross in, but it is headed clear, and the referee blows his whistle! After a short break, we’ll have 30 more minutes of Spain passing it among themselves. Russia perhaps gets their final chance of regular time, but Fedor Smolov curls his shot well wide. Andrew Das: The Russian fans are on their feet at the Luzhniki; they think they’ve won the 90 minutes even if they’ve lost the statistics on points, and want to try to steal it here. Spain gets three corners in a row, but can’t get a good shot off. The fourth official signals four minutes of extra time. Aspas chests a pass back to Iniesta, and his low on-target shot is parried aside. The rebound comes to Aspas, but his shot is dragged wide. Spain looks much more dangerous and direct with Iniesta and Aspas on, making you wonder why it took until the 80th minute for them both to be on. Andrew Das: Akinfeev may just have kept Russia in the World Cup. Dove right to stop Iniesta’s shot from the top of the area, pushing it right, then scrambled up to paw away Aspas’s follow shot with his left hand. Super play. The ensuing corner sort of awkwardly bounces through the box without being touched, though there are appeals for a hand ball. The video assistant referee takes a look, but sees the ball only hit Sergey Ignashevic’s shoulder, not arm. Andrew Das: That’s a good use of V.A.R. there; Kuipers stops the throw while they look for a hand ball on the replay, but when it shows the ball his Ignashevich in the chest, he takes the V.A.R.’s word and waves play to continue. A few seconds delay to get the call right. Spain makes their final change, and it’s an interesting one. Iago Aspas, who is a sort of hybrid striker/winger, comes in for Diego Costa. He scored the late equalizer against Morocco. Andrew Das: That’s the most movement we’ve seen from Costa in an hour as he sprints to the sideline to be replaced by Aspas. Hierro really needed to do something, or at least send on someone will to run around a bit more, cause some confusion. Let’s hope those were the instructions to Aspas. Spain currently running the world’s largest, most boring rondo: just encircling a Russian team that doesn’t seem to be trying too hard to get the ball back. It is as if Spain thinks the first team to 1,000 passes automatically wins. A long Koke pass goes high over Marco Asensio’s head and out of bounds, which is a good metaphor of how dangerous Spain’s attack has been. Jordi Alba is taken down by Roman Zobnin, who gets a yellow card for his troubles. Right back Nacho makes way for Dani Carvajal, who started each of the last two games. Andrew Das: It’s amazing how Spain never seems to run out of Real Madrid or Barcelona players to bring on. It’s David Silva who makes way for Iniesta. Andrew Das: Silva didn’t really show much today. If anyone can sort Spain out, create something out of nothing, it’s probably Iniesta. Iniesta, 34, is surely in his last World Cup. And after all he’s won, he absolutely does not want to go out to Russia in the round of 16. Russia makes their final substitution, taking off goal scorer Artem Dzyuba for Fedor Smolov. Spain still has all three of their substitutions left, but Andres Iniesta is coming on shortly. Andrew Das: Russia has used all three of its subs now. They’ve also grabbed a bit more of the momentum, though they’ve still been out-passed today by nearly three to one. Last I checked, Spain had completed about 600 passes, Russian just under 200. Diego Costa thought he had a little breakaway going against the Russian defense, but the offside flag is up. He just know it. Here comes Denis Cheryshev, on for Aleksandr Samedov at attacking midfielder. Cheryshev has played in Spain since he was 12, and would love to score against this team full of Real Madrid and Barcelona players. A great chance for Spain and David Silva. He creates a little bit of space to get his head on a cross, but sends it wide of the left post. Diego Costa gets a nice through ball behind the defense, but his cutback is blocked out. Russia clears the subsequent corner away. Spain looks like a version of classic Spain that has been run through the copier. It’s definitely Spain, but they’re lacking the edge, the detail and the definition that made them Spain. It’s not possession to intentionally lull Russia to sleep, or possession that is constantly probing for openings. It’s possession that isn’t creative enough to regularly trouble Russia. For Russia, the plan is simple: Keep doing what they’re doing. For Spain, the decision is much harder: When, if ever, do they try something new? Spain has always been supremely confident in sticking to their game plan, assuming the goal is coming eventually. But they could go more direct to Diego Costa, or bring players like Andres Iniesta, Thiago or Iago Aspas off the bench. Spain immediately on the attack, with Isco doing most of the hard work. The ball eventually skips to a wide open Jordi Alba, but it’s at an awkward height and he’s only able to thrust a quadriceps at it. We are underway! Russia has brought Vladimir Granat on for Yury Zhirkov. Russia stays in the 5-4-1 though. No change in formation. Spain and Russia go into the half all even 1-1, as the World Cup of strange goals continues. Spain’s came on a free kick own goal, while Russia’s was from a yellow card after a hand ball in the box. Spain has dominated possession but failed to generate many chances, while Russia has sat back and looked to score on the counter. Andrew Das: Spain must be kicking itself for not pressing harder for a second goal before halftime. They were in total control, and Russia was willing to lie back and take whatever they did. But content in possession, Spain was happy to play keepaway — a winning strategy unless, you know, you somehow give up the tying goal and let the hosts and the crowd roar back to life. The half ends with a Diego Costa header and a Russian counterattack, but neither amount to anything. In the final minute of the first half, Spain takes their first shot. It’s from Marco Asensio outside the box, and it is blocked. Spain’s defense has been uncharacteristically error-prone this World Cup, but at some point it stops being uncharacteristic and is simply the reality of the situation: David de Gea’s fumbled shot in the opener, Ramos and Iniesta’s miscommunication against Morocco and now Pique’s hand ball for a goal here. Artem Dzyuba slams the ball into the corner as de Gea dives the wrong way. The Moscow stadium sounds deafening. Strange arguments from Spain over the penalty: Pique rose with his arm over his head. Even with his back turned, that’s an unnatural position that’s indefensible when he got an advantage from it. The score is even, though the game surely has not been. Penalty kick for Russia! Big Artem Dzyuba rose highest on the corner kick, and headed the ball off of Gerard Pique’s arm, which was sticking up straight in the air. All of a sudden Russia is on the front foot, and Spain’s defense looks unorganized. Russian corner coming up. Sergio Ramos was unable to deal with a high ball, eventually giving Aleksandr Golovin a shot from 15 yards out, but he curls the ball wide of a diving David de Gea and wide of the post. Spain is really trying to stretch Russia out, with Jordi Alba and Nacho practically stuck to the sidelines, and Sergio Ramos pinging balls from sideline to sideline. If Russia can get some high balls into the box, they would seemingly have an advantage. Forward Artem Dzyuba is enormous, and outside of Sergio Ramos and Gerard Pique, Spain doesn’t really have height or physicality at the back. Andrew Das: The crowd is turning on Spain’s possession now, whistling as they just toy with the Russians. But Russia isn’t doing much to change the game here, either. Current pass count on that last stoppage: Spain 231, Russia 58. It’s going to get worse. Russia’s defense is actually performing quite well. Spain has yet to take a shot, and haven’t really had any dangerous chances except for the free kick. Too bad that free kick resulted in a goal. At some point Russia will have to open up in search of a tying goal, but when will that be? Probably not until the second half. Roman Zobnin sees an opening and takes it from midrange. His shot sails over the bar. Sergio Ramos was defended 1-on-1 at the back post on the free kick, and it looked like he managed to get a foot on the ball while practically being tackled. On replay, that will be ruled a Sergey Ignashevich own goal. Ramos was swinging at it, but the ball ultimately bounced off the back of Ignashevich’s leg and in. I suppose the lesson here is to not turn your back to the ball while tackling the attacker on a free kick. That’s the second own goal for Russia in this tournament. Andrew Das: Ramos will claim that goal, scored while he and Ignashevich fell together at the back post. Tough break — Ignashevich knew nothing of it — but fair for Spain, which has dominated so far. That’s the 10th own goal of the tournament by the way, a World Cup record. Far and away the leader for the Golden Boot. Yuri Zhirkov’s rough challenge draws a foul from the referee Bjorn Kuipers. Spain will have a dangerous free kick from the wing, as soon as Nacho gets some treatment for taking studs in the leg. So far the game is playing to type. Spain has all of the possession and is attempting to unlock the Russian defense with quick movement and passing, while the one time Russia got the ball they made a break for it and earned a corner. Yuri Zhirkov grabs a rebound and lets one fly from long range. Spain gets a body on it. No threat. Russia has an ultra-defensive setup. They are starting 5 defenders at the back, and their breakout star of this World Cup, Denis Cheryshev, is on the bench. He started the tournament on the bench, but came into the first game early after Alan Dzagoev’s injury. Andrew Das: Russia is playing five across the back today, with the 38-year-old Sergey Ignashevich holding down the center. Diego Costa already has set up shop in his living room. Jordi Alba tries to take it himself for Spain, but Russia’s defense deals with him quickly. We are underway! Spain is in red, hosts Russia are in white, and 80,000 fans are in Luzhniki Stadium to cheer them on. Andrew Das: Today’s referee is a veteran Dutchman, Bjorn Kuipers. He’ll know the Spanish players from European games.